As I considered making this artwork, I explored a biblical investigation of nature symbolism, particularly with reference to Matthew 6:25-31. My starting point in examining how symbolism works was to ‘consider the lilies’ which arise every year from what appears to be rubbish. I am reminded of Jesus’ resurrection and my resurrection through him. The topic ‘Resurrection in the Garden’ allowed me to explore the connection between the created world and the gospel. Conventionally the lily is a symbol of resurrection and purity. In Matthew it also teaches about trust in providence, so I used only found objects to paint on. My garden functioned as a source of images. The juxtaposition of these junk materials and careful representational painting to honour creation extended my reflection on life and death. The painting (She thought he was) The Gardener depicts Mary Magdalene seeing the resurrected Jesus and assuming he is the gardener. I used what I found – a divided table top made of medium density fireboard with a parquetry veneer made to imitate wood. Its almost egg shape seemed appropriate for Easter, but I had to break it as it was too big and heavy to carry. This way I could transport the central painted section between my art school studio and home. I came to identify this broken shape with myself. The outer sections I buried in garden rubbish for a few months to deteriorate, so they warped, stained and fretted away. I imagined them to be like myself when I am not looking at Jesus. Entropy prevails. In the shadow of the figure of Jesus I healed the division between the two sides of the table with cotton cloth pasted on, then painted over. Mary is shielding her face from the light which she is looking into, seeming to come from behind Jesus. Normally there would be a shadow stretching forward, but this darkness is light (1 John 1:5b, ‘God is light; in him there is no darkness at all’). Her hand held up to shield her face from the light is echoed by the Stargazer lily behind it even as the fingers of her hand echo the lily. They are part of the flourishing garden painted in the shape of an ‘enlightened’ shadow. The outline of Jesus was cut out. I inserted a piece of thick tree bark which had a scar in an appropriate place suggesting a wound. The bark indicates the original tree, as Jesus is the originator of all. Creator, caretaker, gardener! 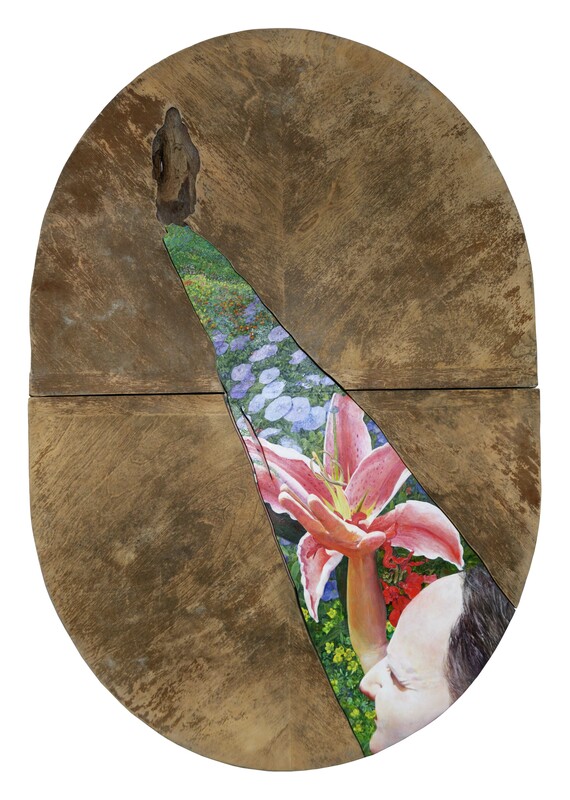 Helen Sherriff: (She thought he was) The Gardener, 2013, acrylic and oil on found medium density fireboard table top with parquetry veneer and bark insert, 1.5 x 1.07 m.
Helen Sherriff is an Australian visual artist who has worked predominantly with painting and textiles. She graduated from the University ofSouth Australia with a Bachelor of Visual Art (Honours) degree in 2013, but her art career began in 1969 when she worked as a commercial artist. She has since worked as a muralist, illustrator, community arts coordinator and art teacher as well as participating in numerous group exhibitions and solo shows. In 2013 she was awarded the Needham Religious Art Prize for her painting (She thought he was) The Gardener.